When I heard the Atlanta weather forecast called for scattered thunderstorms, I thought it would be awesome to capture an amazing cloudscape. But then I figured my chances of getting a perfect cloudscape in this urban jungle were slim, so I headed out of the house with just my laptop instead. As I headed home that day, I saw the clouds starting to build. The scene was changing faster than I’d ever noticed before, and I started to get a strong gut feeling I’d want to photograph them. 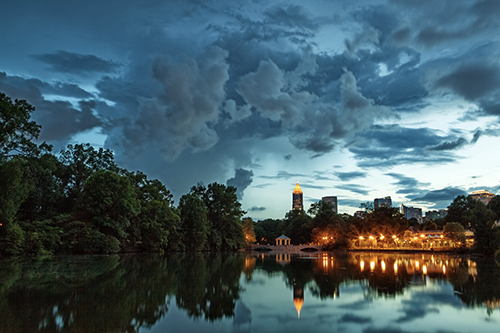 As I drove through Piedmont Park, I was excited because I knew the storm was going to look amazing over the city. At this point, traffic couldn’t move fast enough, and I begin to calculate my timeframe and hope I had enough time to get home to get my gear and get back in time for twilight. Luckily I knew exactly where I’d be shooting from, so when I arrived back at the park I hustled to my favorite spot to get set up. By this point, the blue hour was just a few minutes away and I didn’t have much time to waste. The clouds slowly began to morph and started to look dramatic as I began to shoot. It was quite a sight to see an isolated thunderstorm roll over the city. The lightning helped light the clouds as bolts struck behind the main cluster. Afterwards, I quickly packed up my camera. And as I closed up the tripod, the first raindrops reached me. This was one of those moments we dream about as photographers. You never know when a great photo opportunity will come along. This sudden weather change brought cloud formations unlike any I’ve seen before over the city. In just six months, this photo has made me the most revenue of any image I’ve taken so far, so it was worth going through all the trouble. The dramatic clouds and the vibrant colors of the blue hour are what clients love about this image. That said, all things considered, I got lucky… had I been prepared for the unexpected, I could have captured the image without the added stress of racing against the clock. Since then, I keep a small cheap tripod in the trunk of my car and I try to always have a camera with me, even if it’s my smaller mirrorless camera. Because you just never know what the day will bring!